Arizona boasts an amazing diversity of bats: 28 species representing four families. Bats can be found all across our state in every type of Arizona habitat, from deserts to forests. Arizona was the first state to have a full-time position within its state wildlife agency specifically designated to work with bats. The Arizona Game and Fish Department’s Bat Management Program was created in 1990, when the Department began receiving Heritage Fund money from Arizona Lottery ticket sales. One goal of the Bat Management Program is to facilitate the conservation and management of bats in Arizona by working cooperatively with landowners and local, state, and federal agencies. Arizona was the first state to have a full-time position within its state wildlife agency specifically designated to work with bats. The Bat Management Program was created in 1990, when the Arizona Game and Fish Department (AGFD) began receiving Heritage Fund money from the Arizona Lottery. Originally the project employed three full-time biologists. Their job was to survey bat habitat, identify important bat roosts (focusing especially on caves and mines), and recommend conservation and management actions for areas that were important to bats. However, it quickly became apparent that to effectively conserve and manage bats, we needed help from the larger bat conservation community. In 1994, the Arizona Bat Resource Group (ABRG) was formed as part of the Western Bat Working Group. The ABRG is comprised of agencies, organizations, and individuals interested in bat research, management, and conservation in Arizona. Together, AGFD and the ABRG have developed statewide strategies for bat management and conservation. In 2003, as a result of these efforts, the Arizona Bat Conservation Strategic Plan was finalized. The Plan outlines specific goals and objectives for bat management, research, inventory and monitoring, and education needs that should be addressed in Arizona. The Plan includes information on each of our 28 bat species, habitat distribution maps, and discussion of the types of habitats bats use in Arizona. Similar planning efforts are complete or underway in other states. The North American Bat Conservation Partnership (NABCP) is an alliance of four regional working groups from Mexico, Canada, and the United States. The NABCP was created to support continent-wide bat conservation efforts in an organized way. The NABCP’s four regional working groups include: the Northeastern Bat Working Group, Southeastern Bat Diversity Network, Mexico Bat Working Group, and the Western Bat Working Group (WBWG). The WBWG is a coalition of state bat working groups from 13 Western states (including Arizona Bat Resource Group) and the Canadian provinces of British Columbia and Alberta. The WBWG steering committee includes a core group of individuals and representatives from each of the state working groups. Facilitate communication among interested parties and reduce risk of species decline or extinction. Provide a mechanism by which current information regarding bat ecology, distribution, and research techniques can be readily accessed. Develop a forum in which conservation strategies can be discussed, technical assistance provided, and education programs encouraged. Among its accomplishments, the WBWG was key in the development of a Memorandum of Understanding between the members of the Western Association of Fish and Wildlife Agencies to implement the “Conservation Assessment and Conservation Strategy for the Townsend’s Big-eared Bat” developed by the Idaho Conservation Effort. The goal of the Bat Management Program is to facilitate the conservation and management of bats in Arizona through cooperation with local, state and federal agencies and private landowners. One way we are accomplishing this is by partnering with other agencies and bat researchers to implement the Arizona Bat Conservation Strategic Plan (ABCSP). The ABCSP delineates specific areas of concern for management, research, inventory and monitoring, and education that should be addressed in Arizona by land managers, wildlife managers, and scientists. By far the largest challenge to bat conservation is our lack of knowledge about most species. For many species, even the most basic natural history data is lacking. Consequently, developing management and conservation plans is very difficult. Although Arizona is working hard to gather information on bats, we still do not have accurate population estimates for many species, much less information on population trends. Research and surveys that focus on gaining this basic information are sorely needed and will help direct future management activities. However, the information we do have indicates that conservation actions should be of primary importance. Other challenges to bat conservation include roost disturbance from recreational caving and mine exploration, closure of abandoned mines for hazard abatement, renewed mining, and deliberate vandalism. Excluding bats from roosting areas can be particularly devastating to colonial cave-dwelling bats. Management of roost sites should take into account the needs of the bats and the effects of disturbance on them. Colonies roosting in buildings may be subject to extermination attempts, forcing these bats to find new homes or die. Abandoned mines used by bats may be closed, collapse, or be reclaimed for use in further mining activities. Loss of foraging areas may also have a large impact on bat populations. Even with adequate roost sites, bats may decline if there is not sufficient habitat in which to forage. Some bats travel 20 or more miles per night away from their roost locations to eat, so it is important to consider areas outside the immediate vicinity of the roost that may be used for feeding. Sometimes bats take up residence in our Arizona homes. Bat Conservation International’s Web site has excellent information on how to exclude bats in a way that increases your chances of bat removal, but doesn’t harm the bats. Although public perception is changing, many people still associate bats with rabies. 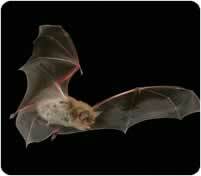 In fact, bats are no more or less likely to have diseases than other animals. Rabies is highly feared, and rightly so, as it is almost always fatal to humans. All mammals can develop rabies, and it is important not to approach any wildlife, as all animals will bite when they feel threatened. Rabies is spread through a bite or exposure of an open wound to saliva or mucous membranes of an infected animal. Therefore, if you find a bat on the ground or hanging low on a building wall, don’t touch it or pick it up. 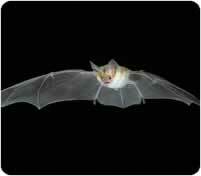 A bat that is within reach and doesn’t fly away when approached is quite likely a sick bat. Healthy bats just don’t leave themselves vulnerable in this way. Remember, there are hundreds of thousands of bats flying through Arizona’s night skies, but only a very small percentage of these bats have rabies. The ones that do, however, often end up on the ground, and are therefore more likely to be encountered by the public. So if you find a bat behaving this way, please leave it alone and contact the Arizona Game and Fish Department or your appropriate county health agency.